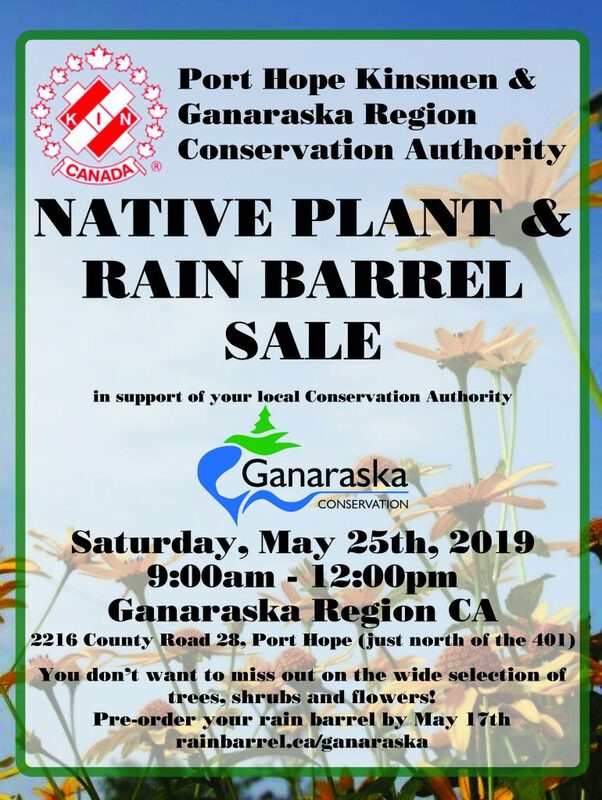 The Ganaraska Region Conservation Authority (GRCA) has partnered with the Port Hope Kinsmen Club to bring back the annual Native Plant Sale in support of the local conservation authority. Visit the GRCA on Saturday, May 25th from 9:00am – 12:00pm to shop for a variety of native plants, trees and shrubs, including plants that tolerate sun and shade, but also can be used as groundcover in your garden. May 25th will also be the pick-up day for pre-ordered rain barrels through the GRCA’s fundraiser in partnership with RainBarrel.ca. Your order will iinclude a rain barrel, a leaf and mosquito filter basket, an overflow adaptor, a spigot and an overflow hose. Rain barrels and other accessories need to be pre-ordered by May 17th and will be available for pick-up at the Rain Barrel & Native Plant Sale on Saturday, May 25th from 9:00am – 12:00pm at the GRCA, 2216 County Road 28 in Port Hope. You can help the GRCA meet their goal by sharing this fundraiser with your family, friends and others. Remember, rain barrel orders must be received by May 17th! Order today at www.rainbarrel.ca/ganaraska. The GRCA thanks the local community for its continued support. For further information about rain barrels and native plants, email info@grca.on.ca.